SEAS U22RNY/P H1657-04. Superb 8" 4 ohm woofer. High 94.50 dB Sensitivity. £57.92 Excl. VAT. High sensitivity Curv woven Polypropylene cone. Low distortion. Injection moulded metal chassis, intended for ported designs. SEAS U22RNY/P H1657-04. Superb 8" 4 ohm woofer. High 94.50 dB Sensitivity. 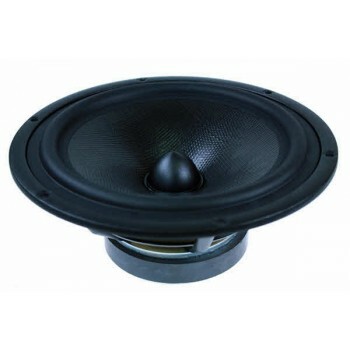 Prestige 8” Lower Midrange/Woofer with an injection moulded metal chassis, intended for ported designs. Featuring a New Curv cone, a woven polypropylene with excellent internal damping together with perfectly matched moving parts gives a smooth, extended frequency response. Bumped back plate in the magnet system together with a high temperature voice coil wound on an aluminium voice coil former giving low distortion and high power handling capacity. A heavy copper ring below the T-shaped pole piece reduces non linear and modulation distortion. The bullet shaped phase plug reduces compression due to temperature variations in the voice coil, avoids resonance problems which would occur in the volume between the dust cap and the pole piece and increases the long term power handling capacity.